Basic 12 Bar Blues Made Easy! 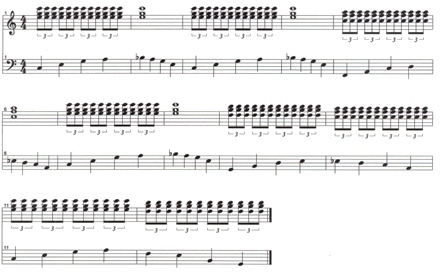 This first example is a basic 12-bar blues progression in the key of "C". I have used a very simple left hand bass line and easy "root position" chords for the right hand. This should be a fairly easy one for you to play. Click on the right arrow of the player to hear it. You can learn to play blues piano! Simple, right? OK now we are going to make the right hand a little bit fancier by using inversions of the chords and a triplet rhythm. You will find that blues and jazz is based on this triplet feeling. You will probably want to play this one slowly at first. Did you get that? NOW, let's make the LEFT hand a bit more interesting. This example keeps the same right hand part as the last one, so you can concentrate on your left hand. 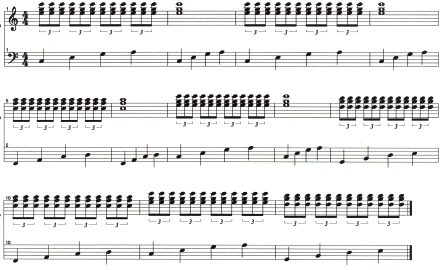 HINT: Cross your 2nd finger over to play the extra notes in the left hand--the "Bb" and "Eb". Practice these examples until they are easy and then try "transposing" them to different keys. If you need help,Blues Chord Progressions will make it easy for you! Have fun and keep checking back because I will be adding more blues piano lessons in the near future. If you have questions, you can ask me at Ask Piano Questions. It's free! Leave "Blues Piano Lessons" and Go To "Online Keyboard Lessons"